Stop Smart Meters Australia has been advised by the Department of Health & Human Services (DHHS) that “radiofrequency matters are considered to be outside the scope of the Public Health and Wellbeing Act 2008, as the Commonwealth has specific legislation (the Radiocommunications Act 1992) with the ability to both make standards for health protection and ensure compliance with them”. Huh?? Since when was a Health Department able to wash its hands of health issues? And since when was a regulatory body such as the Australian Communications and Media Authority (ACMA), which has zilch expertise in health, deemed capable of implementing policy to address the needs of people with electro-hypersensitivity (EHS)? Or carry out SSMA’s request to implement a smart meter post-rollout health surveillance program? Once again, the inconvenient fact that many Australians have suffered, and continue to suffer, adverse health effects as a result of exposure to wireless smart meter emissions is being ignored by government. 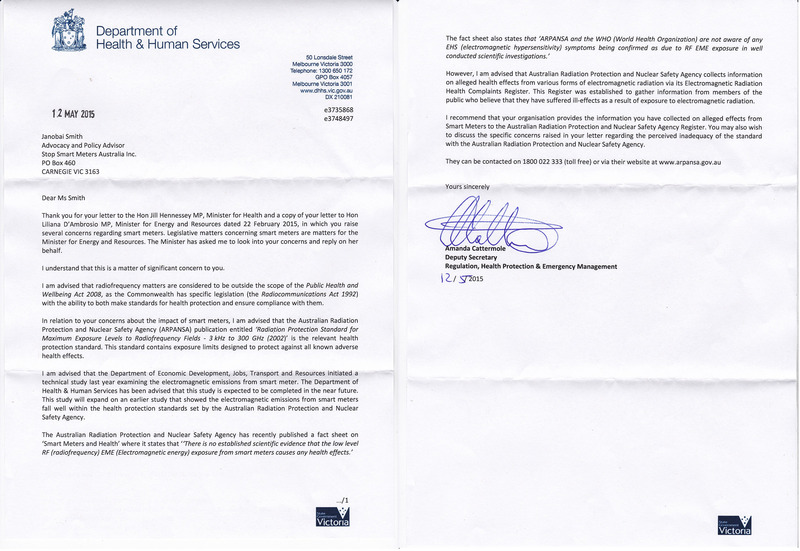 Instead DHHS states that “…where there are other specific laws that regulate activities then generally the threshold required to exercise powers under the Act is not reached because any risk to public health is already being appropriately managed”. That’s cold comfort for the Victorians whose lives have been turned upside down as the result of the rollout of smart meters. This entry was posted in Smart Meter and tagged ACMA, Australian Communications and Media Authority, Department of Health and Human Sevices, DHHS, EHS, Electromagnetic hypersensitivity, Health, smartmeters. Bookmark the permalink. A submission was tabled seeking RHC support for making a more definitive statement, in conjunction with Australian Communications and Media Authority (ACMA), advising publicly that the collection of devices operating in the RF communications sector do not present any significant exposure by virtue of the small percentage of the standard that persons are exposed to. The recent ARPANSA Study over the greater Melbourne metro area has confirmed this via direct measurement, however RHC Members stated their function is not to promote any form of technology and this does not fall within the purview of the RHC. not safe? What part of that don’t you understand?. Exposure whether significant or not is irrelevant. All claims have to be proved and that goes for our side as well. The Radiation Advisory Committee would if asked, in a legal notice or affidavit have to provide evidence to support anything they say, if they can’t do this, whatever they say is invalid and just an opinion. Then the individual has to decide whether they are offering an opinion of facts, only you can do this yourself. They should also be made aware that they are acting under their own liability. It doesn’t matter what the exposure is even if it was small, the fact is that a risk exists and as such t .
Everything they say has to be rebutted in writing, if its not then it stands as the truth. Shameful and criminal is the fact that this totally unnecessary roll-out of spying devices is continuing to harm ALL biological life, with younger children and babies being some of the worst affected. These governments do not care at all about the people. People need to take back their freedoms….too much damage done already! Amanda Cattermole is a fool and should get the sack for giving misinformation to the public. It seems that a large part of the battle for us is that we have to deal with people who are incompetent. They aren’t even smart enough to know whether the things they are saying are true or not and they aren’t smart enough to understand what the consequences for the public could be if this exposure to RF continues. They probably don’t even have the intelligence to put a report together which reviews the evidence. The same is true of the people at ARPANSA. It seems that they will just continue passing the buck and avoiding work until large numbers of children start dropping dead from cancer or end up with neurological problems. Shame on you Amanda. This letter is proof that the health department is negligent. They freely admit that they are not bothering to do their duty in assessing public health risks – extraordinary! If the exception of RF to Public Health and Wellbeing Act 2008 is not noted in this act then it is surely just their personal opinion that RF is considered outside this act. What legislation can Health Department quote to back up their claim that RF is outside this act? I have also watched Rob Reiken video. Very interesting. The security threat thing could be another angle to look at. What a shameful reply to Stop Smart Metres. The woman that wrote the letter and signed is liable for her own actions, she probably thinks she is not but she is. If she has given out misleading or false information then she might be guilty of professional malpractice..Where are these laws, she needs to produce the evidence. What threshold does she speak of ?She is a public servant, she works for us, she doesn’t decide the threshold. The facts are that they are responsible, this woman is, the Chief Health officer is and The Department of Health.The State of Victoria is also responsible as well.. They don’t have the authority to put anyone’s health at risk.She might also want to explain how they are managing the risks. How would they even begin to manage any risks, when the risks are not clear. Everyone is different so one man might be more at risk than another, how would you manage this? They must have a different definition of health to me. If smart meter radiation does not come within The Department of Health’s scope of office, then Rosemary Lester was acting outside her professional capacity and under her own liability. it just so happens that radiation is within the Department of health’s scope of office, its an environmental issue and it can cause health problems. The Department of health is responsible legally for this issue and if they fail to address this issue then they have breached the health and Wellbeing Act. They are required under the Act to put in precautions and they haven’t. They have a legal responsibility and a moral responsibility to put in precautions.If they do not do this then the Department of health and The new Chief Health Officer are liable, responsible and should be held accountable.It is fact that they deal with both types of radiation and that is why they have a radiation advisory committee. if smart meter radiation and .other sources of radiation did not come within the legal requirements of the Department of Health, then Dr Rosemary Lester should not have commented as it’s not her responsibility to comment. Give out misleading and false information that may cause harm comes under negligence, perhaps they can look up the laws that we all have to abide by. They have to act within the law. The reason the power companies have changed their use of terminology from “smart meter” to something else such as “digital meter” or “AMI meter” is to conceal the fact that “smart meters” are 24/7 radio transmitting devices and not electricity meters. The term “digital meter” gives the deliberately misleading impression that a “smart meter” is just another electricity meter. It is a term that hides the illegitimacy of 24/7 transmitting devices as distribution infrastructure. It is a term that highlights the electronics aspect of the device but removes visibility of constant microwave radiation transmission activity. It is a term that endeavors to diverts attention away from the fact that the there is a significant lack of reference to the term “smart meter” in the Electricity Distribution Code. Making a false statement is a crime. Victoria’s Chief Health Officer has endorsed the advice of the Victorian Ministerial radiation Advisory Committee, consisting of doctors and experts in the field of radiation, which found “that there is no substantive evidence to suggest that exposure to radiofrequency radiation such as from Smart Meters can increase the risk of chronic health effects, such as cancer”. Further information is available on the Chief Health Officer’s website at http://www.health.vic.gov.au/chiefhealthofficer/smart-meters. They can’t have it both ways-or can they?. But, as the white rabbit explained to Alice, “words mean whatever I want them to mean”. Well, following the link in the post for the national Radiation Health Committee minutes, even if the promised discussion raising SSMA’s concerns isn’t mentioned, at least this committee had the nous not to accede to the request listed in Item 3.11. Apparently the committee was being called upon to advise publicly that smart meters “do not present any significant exposure by virtue of the small percentage of the standard that persons are exposed to”. By comparison, Victoria’s ministerial Radiation Advisory Committee appears to have its head buried firmly in the sand. Here’s their 2015 report: https://www2.health.vic.gov.au/about/publications/annualreports/radiation-advisory-committee-annual-report-2015 Smart meters and RF get mentioned in items 3.3 to 3.5. They can advise all they want as long as they agree to liability. They can’t put all this in an affidavit.